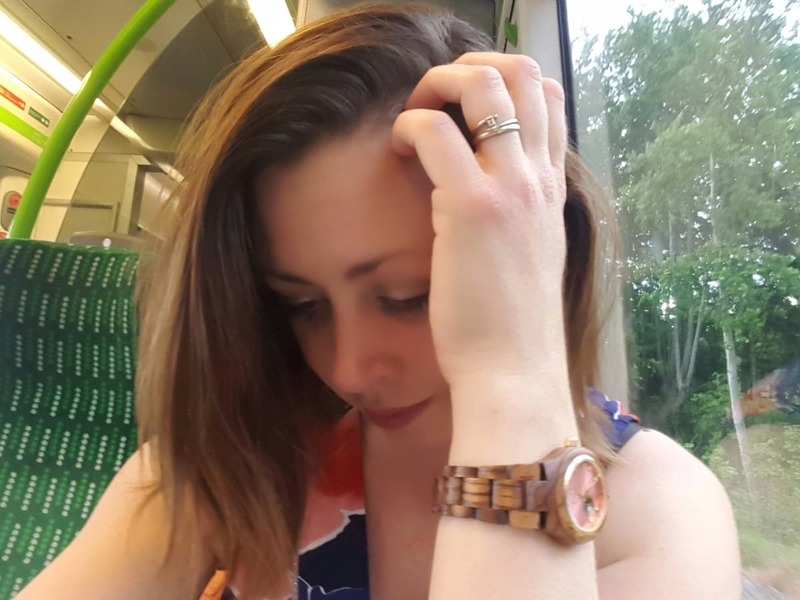 Ethical purchasing is an issue really close to my heart because I hate the idea of my purchasing decisions having a detrimental effect, whether that be on the people that made the item or on the surrounding environment. Sadly, one of the main offenders when it comes to unethical production practices is the fashion and style industry. Eighteen Rabbit sell gifts, art and craft pieces that are ethical and fair trade. Their focus is on design and style, so as well as being ethically sound, many of their products are unique and all are fabulous. They are also based locally to me in Hay on Wye, so next time I’m there I will be checking out their shop as well. 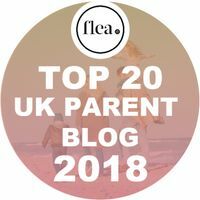 I am always keen to feature ethical businesses on my blog, because they are the sort of places I buy from and want to support. 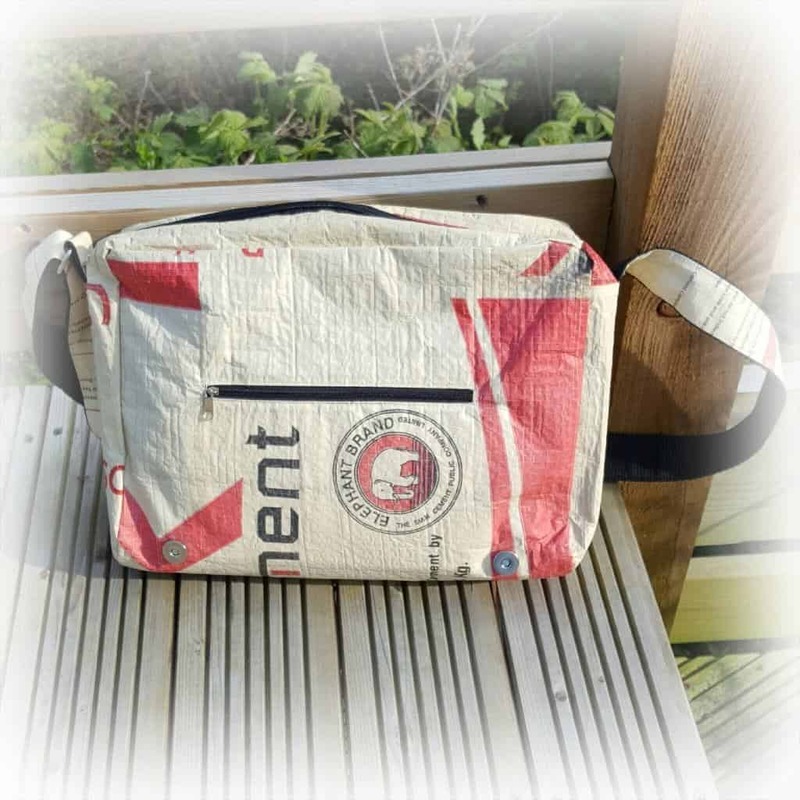 Eighteen Rabbit very kindly sent me a fabulous Elephant Cement messenger bag to review. But it came as no surprise to me when I looked at their website and realised that I already owned one of their other products, a Justice Bag. As soon as I saw these messenger bags, I totally fell in love with them. I think messenger bags are incredibly practical, I can fit everything in it that I need for the day and I can easily carry it on my shoulder without dropping it. 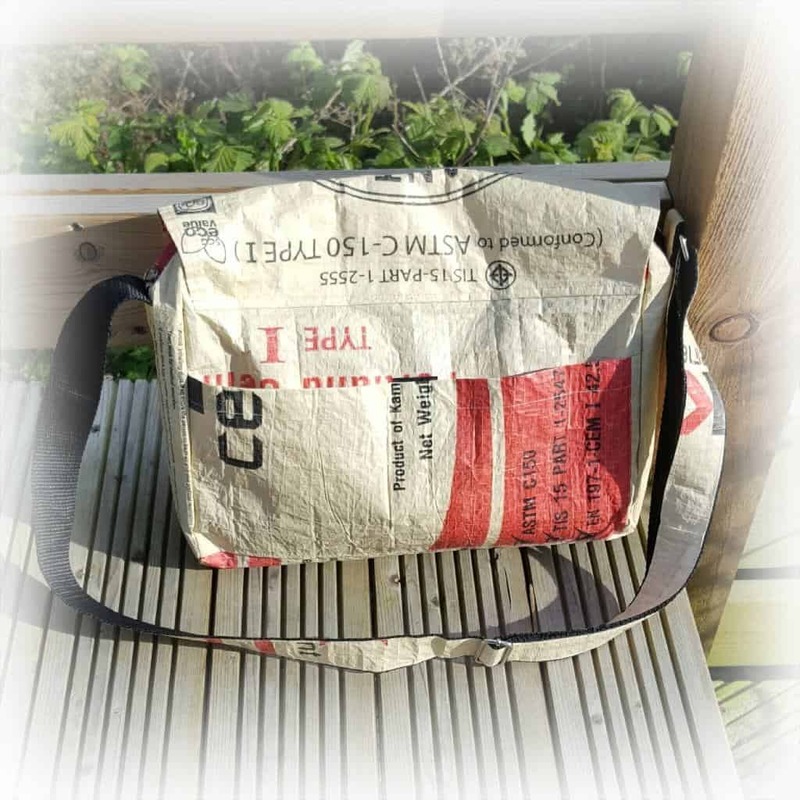 But these particular messenger bags go one step further – they are hand made from recycled cement sacks. The cement sack material has taken a bit of getting used to. It makes quite a loud crinkling noise when I open and close it. That said, now that I’m used to it, I love the noise. It makes the bag feel much more sturdy than a normal fabric bag, and I think it probably is. I’ve been using it for about a fortnight now and took the photos of it today. It is faring incredibly well with my somewhat chaotic lifestyle. I also love the look of the messenger. It really stands out and the design on it is lovely. 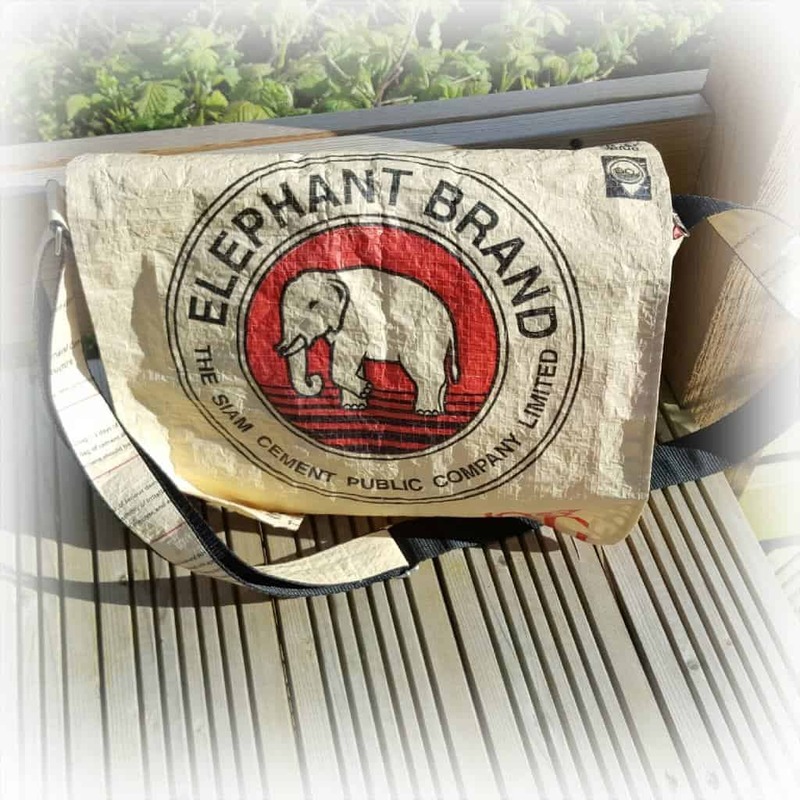 As well as the elephant logo on the front flap, it has the cement bag detailing on the back and under the flap. It has plenty of pockets both inside and out and I find it really practical for every day use. 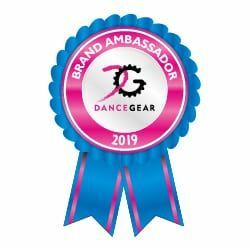 It fastens with sturdy magnetic poppers on the front and there are zip pockets both on the outside under the flap and on the inside. There is also a velcro fastening pocket on the back which is great for putting shopping bags in. The bag is made by Craftworks Cambodia. They are an organisation working with people who are disabled or have HIV/AIDS and live in an environment of poverty and war. By trading fairly with people in such a situation, we have the power to afford them a better life, just through our purchasing decisions. Through Eighteen Rabbit, it is possible to purchase a superior quality item that is priced at just £15 and know that the money is going to worthy recipients. In my mind, this is infinitely preferable to paying a higher amount to a high street store and knowing that the people who made it will have been paid next to nothing for working in terrible conditions. Please note, the Elephant Cement messenger bag was sent to me for the purpose of a review. All views, opinions and ethical purchasing decisions are my own. Hi Natalie, the fact that the bag is quite different as well as raising money for a good cause would attract me. I have several reusable soft bags that I’ve collected over the years that come in handy, and I reduces the amount of unnecessary plastic bags I use.